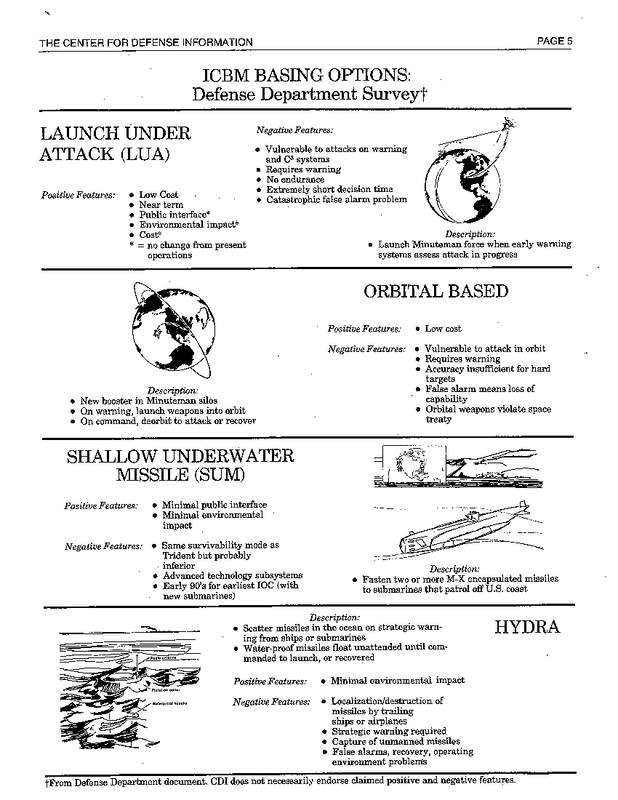 Stan Norris sent along an old Center For Defense Information publication (Defense Monitor 6:10, 1981) that includes what appears to be a Defense Department comparison of 30 different basing modes for US ICBMs. Thirty! Three-zero. On the land, under water, in space! Yes, in space. I think the key takeaway on this one is option number 30: the only one with a number, and the only one with neither negative nor positive features. Translation: “This is the default. Most of the alternatives are worse, none are clearly better, and look – we scoped out twenty-nine of them! Now can we please go do it the way we wanted to from the start, or haven’t we tired you out with bogosity yet? This is the default, resistance is futile”. I do agree that, to the extent the alternatives have anything going for them, it would be in combination. Hybrid trench mixed with dash to shelter actually looks pretty good to me, with maybe a bit of south side basing or hard tunneling for good measure. On the other hand, conventional silos under a modest BMD system also looks pretty good to me. Excellent. 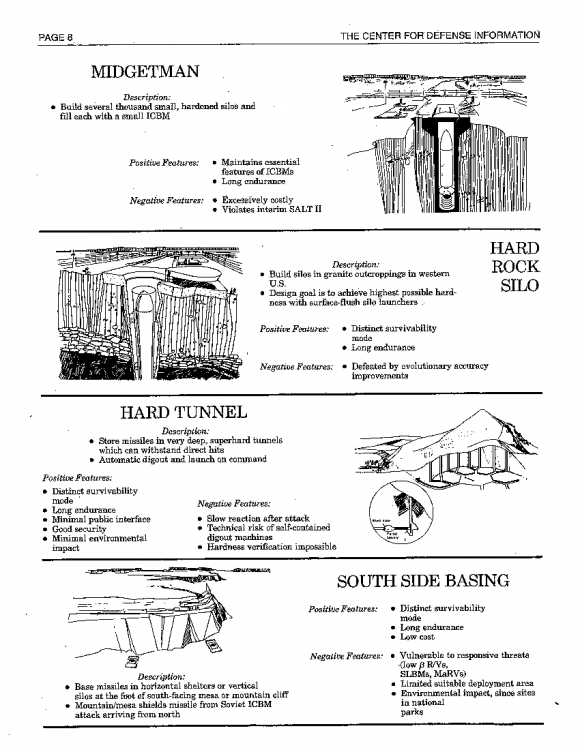 My favourite is the giant artificial quicksand silo. 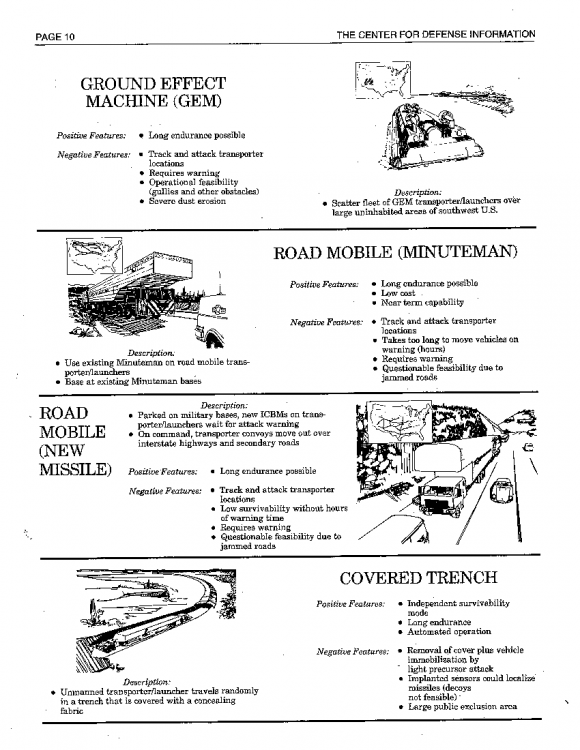 ROAD MOBILE… Negative Features: … Questionable feasibility for jammed roads. You know, I hadn’t really thought about the effects of a traffic jam on a road-mobile ICBM before. I’m imagining one of those stuck on the 14th street bridge at rush hour. Funny you should mention “traffic jam”…. Wow, nice list. I think my favorite is Hydra for being the craziest option and also because it would give Aquaman a real purpose in life. 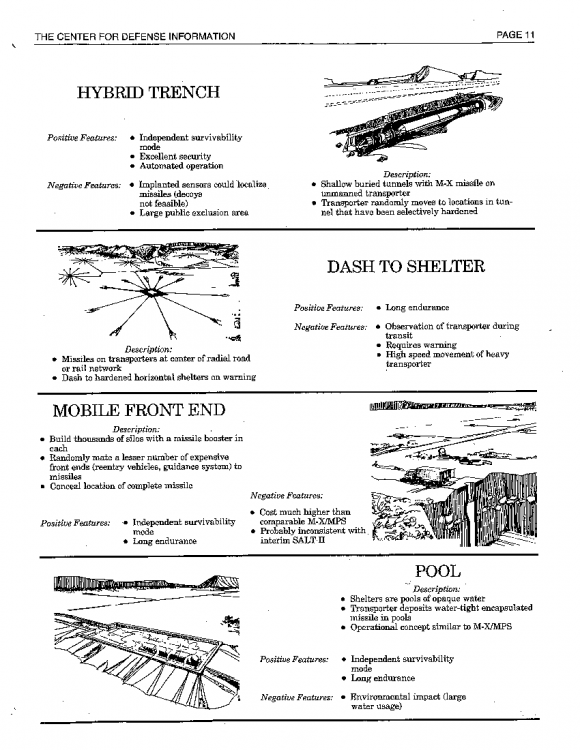 I am stumped by the “rush to shelter” design: the way I read it is that you have all your missiles sitting pretty and then on warning you rush them off to hardened shelters so that the incoming nuke doesn’t take them out. 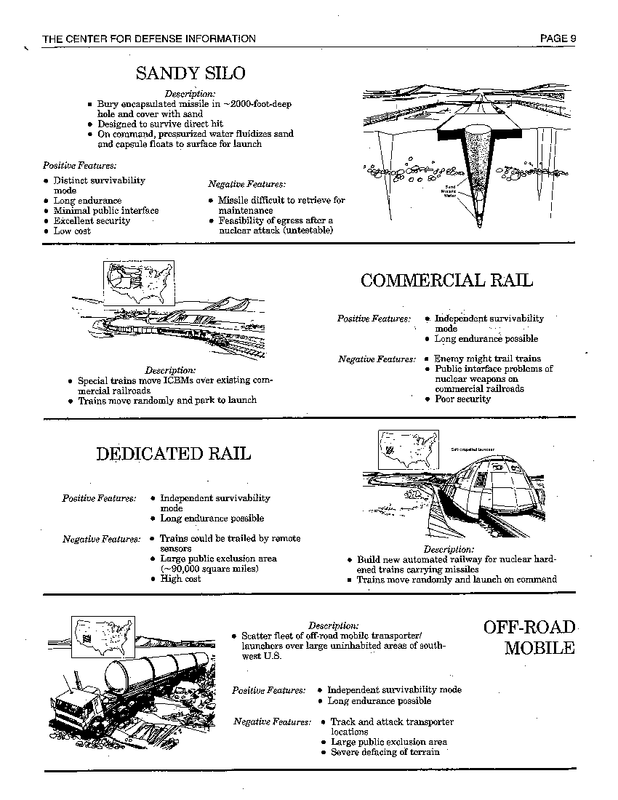 2) someone badly wanted to develop a high-speed rail engine carrying a fuelled missile with nuclear weapons and its associated amazing braking system. But I do concur with kme: the artificial quicksand silo is truly brilliant. I was wondering how the missile punches out of the Trinitite though! 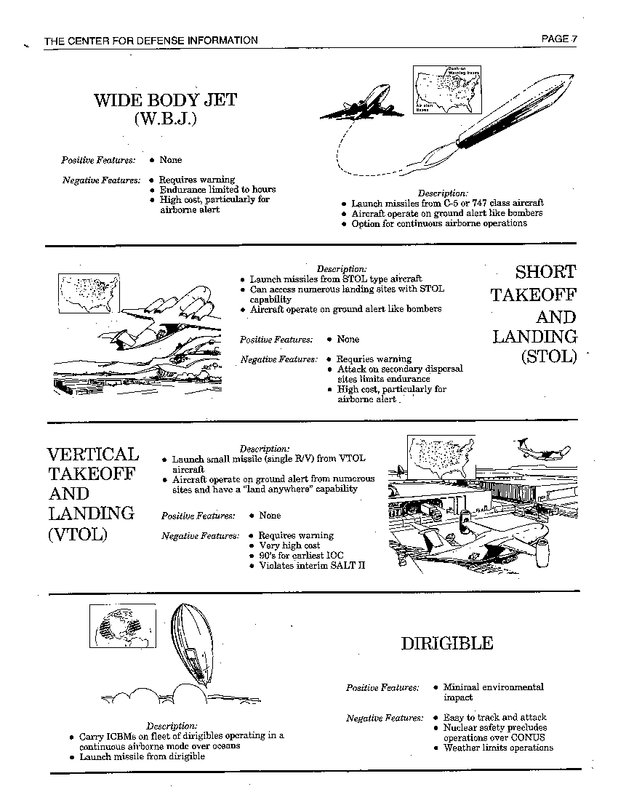 I like the options (seemingly mostly airborne ones) with “Positive Features: None”. Stick the nukes under a mountain, and one of the negatives becomes ‘hardness verification impossible’ – Go on, let us test it, nobody will miss a small mountain somewhere in Nevada, you can almost hear them say. The Orca seabed option was illegal before they listed it. 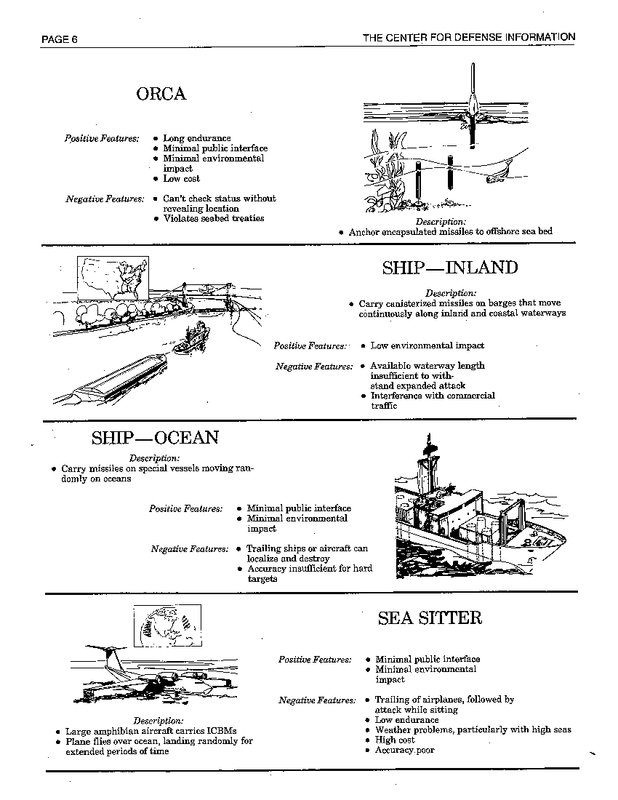 See Treaty on the Prohibition of the Emplacement of Nuclear Weapons and other Weapons of Mass Destruction on the Sea-Bed and the Ocean Floor and in the Subsoil Thereof. Entered into force May 18, 1972. What were they thinking? were they thinking? they thinking were…who? But if seabed/ocean floor is illegal, what about nuclear torpedoes fuzed to explode on contact released as homing devices on the seafloor? I’ve got to buy Stan a drink for providing that stroll down memory lane for an affectionate gaze at the sheer loopiness of everyday life on the other side of the looking glass (or, as those of my vintage will recall, the other side of the “Looking Glass” — if you’re under 50, ask Krepon). I treasure the memory of a conversation in the late ’70s with a good friend who staffed one of the Hill committees who told me that his worst headache was phone calls from eager young staffers who had read six back issues of Aviation Week and had come up with a NEW basing mode for MX. I knew the man made movies, raced cars, and concocted salad dressings. And he worked toward nuclear disarmament, too? Yes, Paul Newman was Michael Douglas before Michael Douglas. I must say I was disappointed that the so-called “Orca” option didn’t involve real whales as platforms. Seems their creative juices ran a bit dry on that one. Dr. Evil evidently cryogenically froze himself after hearing about “Orca” as a basing option but before it was rejected. Sharks with frickin’ laser beams are the only feasible version of SDI in that case. I’m left wondering what the Dirigible option would have been like. About the time that pub came out, I got to sit in on an all-day DoD briefing on the topic. The thing that struck me was that they had *no* force-wide criterion — and the question was specifically asked — for evaluating the basing options. That is and e.g., if you had 100 MXes, was there a requirement that 50% survive a canonical SS-18 counter-force attack with 90% probability, or what? I came away with the slightly uneasy impression that they didn’t really know what they wanted the residual ICBMs for. As I understand, they didn’t have to be specific – the idea was to preserve the proverbial “advantage in the throw-weight balance after a third strike”. This is a really important point you make. If I understand what you’re saying, back in the period you were describing, force analyses were bing conducted (at least the ones you saw) without using “force-wide criteria”, meaning (if I understand you correctly) that there was some arbitrary fraction of the ICBM force that was required to survive a hypothesized first strike, without considering the survivable capabilities in the other legs of the triad. During the Cold War, that type of thinking seems (to me) to have led to overwrought fears about the ICBM force being destroyed, when (even if that were possible) there would be plenty left in the sub and perhaps bomber force to retaliate. What’s striking to me is that I sometimes see the opposite phenomenon today — leading to equally dubious policy. I’ve seen some recent reports that show, under different assumptions about a future US nuclear force, how that force would score against a set of criteria: e.g., peacetime survivability, crisis survivability, yield flexibility, high accuracy, promptness, appropriateness for signaling purposes, etc… (we can debate the merits of any of those criteria). But the problem is that while the analyses explored whether each force option preserved an acceptable mix of these criteria **in the force**, in many cases, the alternative force structures had no single element which bundled together the capabilities (i.e., criteria) that one would want **in a single platform** — which is the exact opposite of the problem you mention. For example, one might have prompt DVs and flexible-yield warheads in the force, but one wants a single weapon that meets both criteria, the force-wide assessment will be deceptive — and give you the impression you have the capabilities you require in the arsenal when you don’t. I remember “Dense Pack.” I do not miss those times. Essentially, I remain convinced that nuclear weapons, as they are utilized today, can only do one of two things. Destroy the world, or rust. What amazes me the most about this presentation, even despite having lived through the era in which it was created (just barely), is the unspoken assumption that went into it. To put it bluntly, the idea that the USSR would launch a zero-notice first strike and that this was a likely enough possibility that it needs to be a basis for planning. I know there was a lot of fear of this going around then, and a lot of people thought that it was pretty much a given by the end of the decade, but still, it boggles my mind. Everyone understood the implications of a full scale nuclear exchange, nuclear winter and the probable extinction of humanity, and even understanding that they still believed that a reasonable person on the other side would push the button and exterminate not only “us”, but themselves as well. To me the threat just isn’t realistic, and so the billions spent to deter that threat become harder and harder to justify. Does it strike no one else as insane that a good number of the basing options for an ICBM involved turning an ICBM into what was effectively either an SLBM or bomber? That to me should have been a huge signal that land-based ICBMs were fast becoming obsolete, and thus the entire conversation about building new ones should have had a quick conclusion. Say, aren’t you professionally required to recite the ICBM catechism? Those were the days. As I recall, one of problems of the shell game for a movable MX was that there wasn’t enough water to pour all of the concrete that would be needed. There was a silver lining to these basing scemes: because they were economically and politically unfeasible, they served to make the window of vulnerability go away. I don’t recall whether it was the multiple-silo-per-bird MX or the ultra-hard silo option, but one of them required so much steel-reinforced concrete that it would have consumed the entire re-bar production of the United States steel industry for several years. I dug out some old literature and found Council for a Livable World put together a list of 37 basing options. The 37th was rail-garrison basing. Am I missing something, or is something missing from this list? The DuncePack (oops, I meant dense pack) where they planned to deploy the silos so close together that the incoming warheads would commit fratricide. 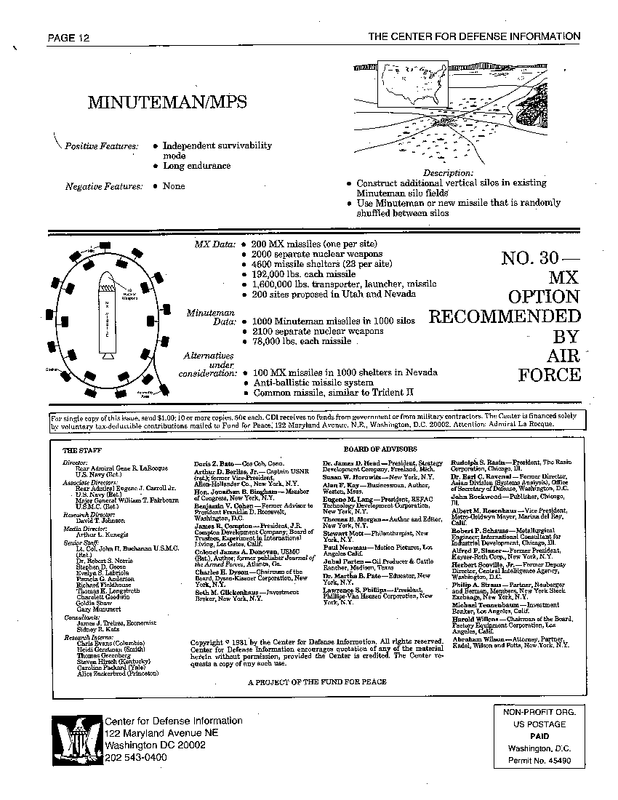 Those that exploded early would destroy later arrivals, and therefore, increase the survivability of the MX missiles. Wasn’t it the utter stupidity of this idea (rather than the total impracticality of the mobile basing modes) that lead to the Scowcroft commission? Or is my memory creating false facts? You know you’re in an alternate history when there are airships….airships WITH ICBMs! I am imagining a steampunk triad. Airships clearly have to be part of that.